Dr. Zoidberg: Is desire to mate a feeling? Part of the 10 year anniversary of Star Wars Lego sets, the Echo Base set fits in with any Star Wars Lego collection or is a nice set to start a new one! Echo Base is a great army building set coming with both two Hoth Rebels, plus two Snowtroopers. Round this out with a Han Solo on a Tauntaun and a nice set of fortifications this set is more than worth the modest price tag of twenty five dollars. As I said the set makes a really good army building set and thats part of where this set shines. 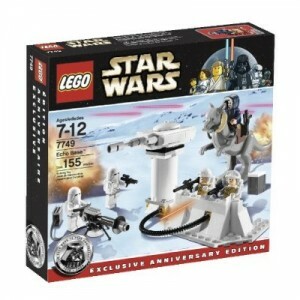 Coming in with two Rebels and two Imperials this set makes nice boost to existing Hoth themed sets such as the Hoth Rebel base, one of the Snowspeeders or AT-AT’s that have been released over the last ten years. The fortifications themselves are both a lot of fun, as they include a firing turret, and a flip up panel that sends the rebel troopers flying. The turret albeit is a bit underpowered but on the plus side its very unlikely to shoot off one of the missiles and take someones eye out. The flip up platform is an awesome idea and works very well. Pushing down on it will send the troopers flying after a simulated direct hit takes out their position! The turret can be attached to either side, and easily combined with additional copies of this set to build and even more impressive fortification. The Snowtroopers also come with an E-Web blaster, allowing for more variation than just the standard hand blasters. Finally, rounding out the set is a snowbound Han Solo with Tauntaun. A very nice addition as it is the first Hoth themed Han Solo with his winter hood, plus it is the first inclusion of the Tauntaun mount. Comes with a pair of binoculars and is ready to ride out into the night to find Luke Skywalker. (Not included just where it fits into the movie) The Tauntaun itself is a very nice mold, made especially for this purpose. All in all a very nice set and a must have for anyone who wants to expand on their Hoth/Ice planet themed Star Wars Lego sets!